A second post for today! :) I'm having some fun playing with my inks. This card has two techniques from my class ... these are techniques that I have done in the past, but I did learn a few tips that make it even better. For the background, I pressed my ink pads onto my craft sheet in random places, trying not to overlap in order to keep the pads from being contaminated with the other colors ... so there were blank spaces in-between. I spritzed with water to activate the inks. This is the smooshing technique. I made a monoprint yesterday that didn't work ... I didn't add enough ink or water so ended up with only a little bit of color on my watercolor card front. Instead of throwing it away, I used it today for this technique. I used the same colors, so it all blended. I placed my card front on the wet craft sheet and pressed down, holding it for a few second so that it absorbed the ink. Here's the part I learned from class ... even though I wasn't happy with the amount of ink on my card front, I dried it with my heat tool and then inked and spritzed my craft sheet again, adding the same card front and picking up more color. I did this three times, drying in-between the layers. I LOVE how it turned out. The second technique is what I call watercolor spritz. You ink your stamp, spritz with water and then stamp. It gives a watercolored look to the image without any of the work. Super simple and fun to do! I did the same with the sentiment. What a beautiful background! Great save! So bright and beautiful. These colors blend perfectly! What a wonderful background you created Loll! love the colors and the silhouette watercolor stamping! Beautiful colours, Loll! Thanks so much for the tips. They are so helpful. I see that at least 3 of my favourite stampers, including you, are taking the online watercolour classes and enjoying them so much. I'm sharing the experience through all of you. Thanks so much! This is so fun seeing what you create from this class Loll. Wow this is so unbelievably striking and gorgeous. I love how it turned out too - great effect with the ink on the craft sheet. Love the speckled sections! Absolutely gorgeous card, Loll! 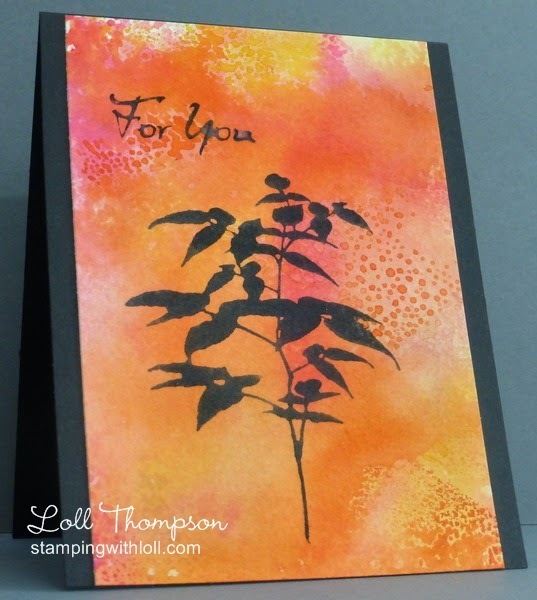 Your background is so beautiful, and really makes the fern pop on this card...just beautiful in every way! Love, love, love that background! Fabulous colors and texture!